This deluxe tote carry-on is compact with many outside pockets. It is a great companion piece for airline travel or road trips. Detachable shoulder strap for convenience. On the Outside, there's a trademarked Outsider® handle that provides a flat packing surface and the new one-touch expansion system. Some editions to the collection include the rounded soft-touch telescopic handle made of 100% aircraft-grade aluminum that locks in the up or down position. The Outsider® pocket provides even more room for packing. The bottom skid plate protects the case from curb scuffing. The side and bottom handles makes for easy lifting. And there are quiet-glide, wide profile wheels. Also the 2520D ballistic, self-repairing, fabric resists wear, water, dirt and abrasions. ABS corner guards are impact-resistant and all cases are equipped with ergonomic YKK Racquet Coil zipper pulls that shape to fit your fingers. All these features found throughout the new Baseline collection. Available in Chocolate, Black and Olive. 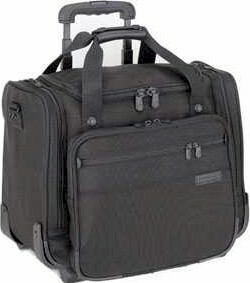 All Briggs and Riley Luggage pricing includes Free domestic shipping and more. Also, no sales tax if shipped to anywhere outside the state of Michigan. On line ordering is of the highest level secure format. We have been in business for over 50 years and offer 30 day Money Back Guarantee. All Briggs and Riley Baseline pieces are backed by Manufacturer's Lifetime Warranty. We also can gold hot stamp your initials at no extra charge, just specify desired initials under "Special Instructions" when placing order.